In Barnabus, Minnesota, on the western edge of Superior National Forest, U.S. Customs and Border Patrol agent Davis Holland doesn’t know it, but he’s about to embark on the deadliest mission of his life. Accompanied by Barnabus’ sheriff Gil Ramsey, Davis begins a trek through snow and forest. There’s no indication this is anything other than a routine crossing, perhaps merely a herd of moose wandering from Canada, until . . .
“There was a low rumble, followed by a heavier crack . . . it wasn’t branches but the trees themselves toppling . . . the ground trembled. A large mass, darker than everything, blotted out the surrounding dimness. Animals stampede through the forest. Fiery-white light brightens the woods, momentarily blinding both men. They stagger to safety, but as their visions clear, they find . . .
“A box sat on the stump in the center of the clearing . . . bodies arranged around in a ring . . . the clean white smell of the freshly falling snow was invaded by the coppery tang of blood . . . then came the laughter . . .
Back in Virginia, Ben McKelvie receives a call from David Severance, cryptozoologist par excellence. Suffering bouts of sleeplessness and remorse from his encounter with a kushtaka, a creature able to take on the likeness of others, Ben’s reluctant to get involved with Severance again. With a bit of blackmail by offering to buy the house Ben owns where the deaths caused by the creature occurred, Severance convinces him to come to the Apostle Islands and investigate this new occurrence. There, Ben is reunited with Smithsonian zoologist Lindsey Clark and Alex Standingcloud, another expedition member. They visit the reservation where Alex grew up, and at a gift shop have their first introduction to a local monster. While Ben’s flippancy rubs the local Ojibwe council the wrong way and Lindsey attempts to discover a relationship between the legends and what has happened, there are more bloody deaths, continuing bizarre incidents, and even fewer answers, none any sane person will accept, that is. The mysterious chest, in a police evidence lock-up, is the key to all, but how does it tie in with what swims under Lake Superior’s ice? As the Ojibwe War Council joins Lindsey and Alex in a fight for their lives on the lake’s shore, Ben and Agent Davis encounter their own nightmares when Barnabus, its neighboring towns, and that section of Wisconsin are systematically destroyed. “A pillar of black smoke rose from what appeared to be a diner. Tongues of flame darted from a shattered window, scorching the chrome finish . . . Gusts of wind blew embers into the nearby Victorian homes. Cars were parked at cockeyed angles in the middle of the street, abandoned . . . It will take a great deal of courage and belief in himself and his fellow monster hunters for Ben and the others to survive this one. Even then, they may be left with worse nightmares than before, Ben especially, as he’s granted his most fervent wish—but with a horrific transformation. 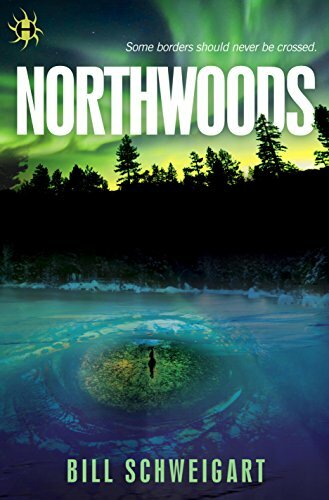 Northwoods truly points up the fact that danger doesn’t have to come from big cities or serial killers, but can also lurk in less inhabited places, as well as in one’s own heart and mind. Abandoning the familiar and over-used vampires and werewolves for lesser known but no less frightening Eastern myths and Native American legends, author Schweigart has again penned an entertaining entry in what is a very appealing and original series. With its vivid descriptions and realistic but sympathetic characterizations, Northwoods will stay with the reader long after the last page is turned.